Today I was super thirsty. I'd had my share of water (it's all I ever drink except coffee). But today water wasn't quenching my thirst. I'm not typically a pop drinker, but we did have some Sprite in the refrigerator and since it's caffeine free I can have it! But I don't love the taste of Sprite. Then it dawned on me! I have flavor packs. I have Sprite. I have thirst. 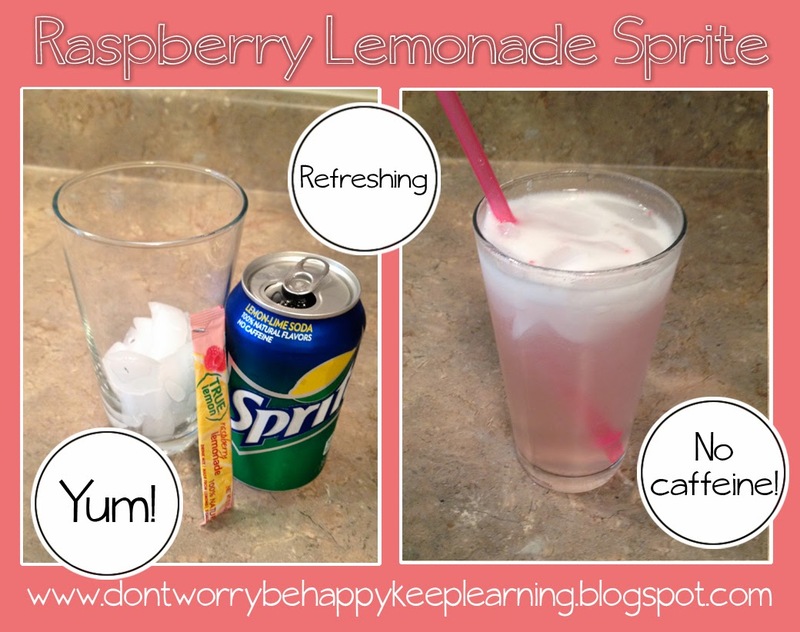 I introduce Raspberry Lemonade Sprite! at 3:40 PM 2 Comments Topics: Blog., Recipes. Make an old vase new with burlap. I'm gaining attraction to burlap. As you may have seen, I used burlap "ribbon" (as I call it) on my Spring wreath. Then again this week I made flowers for my Fall wreath using burlap. I didn't stop at that, though. Now I've used burlap to revamp a vase. I keep hinting at the mantel project my grandpa and I have been working on. Now that it's up on my wall (blog to come soon, I promise!) I can put stuff on it! Like seasonal decor and picture frames! I wandered around Hobby Lobby the other day and stumbled upon the vases. But, remember, I'm cheap? So I scratched buying one [for at least $25] and decided to use the green burlap ribbon I had in my hand already to go home and redo a vase I already had. If my husband is reading this: You're welcome, honey, for being thrifty! This is how you could do it, too . . . All I used was an old vase, burlap "ribbon"and a glue gun! 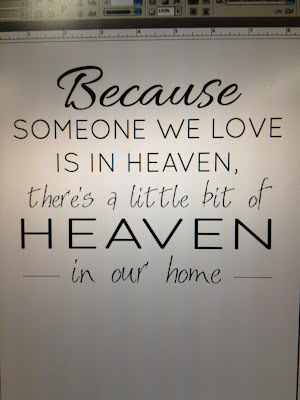 See the sliver of a mantel there? Yup, that's the one I keep talking about. Oh, how I can't wait to show you. That post will take me a while to write, though, so hold tight. at 6:00 AM 1 Comments Topics: Blog., Crafts., Design. I love Fall. There are so many things that make me happy this time of year. Today I wore boots. That makes me happy! 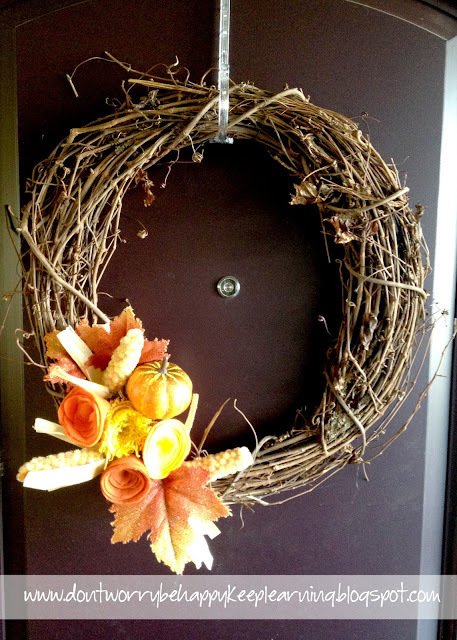 Another thing that makes me happy about Fall is the opportunity to switch out my front door wreath. If you remember back in March I made a Spring Wreath for our front door. I had every intention of changing this wreath out sometime during the Summer, but it never happened. It was really pretty and I just left it there. But now that it's Fall, it needs to change! I made a Fall Wreath last year, but I wanted something new and different this year! I have been seeing a lot of wreath pins on Pinterest and finally decided the next thing for me was the one that required making felt flowers. Looked easy enough! So I got to work! Here's basically how it went . . . It was super easy! And since the felt worked out, I decided to use the yellow burlap ribbon from my Spring Wreath and made another flower with that. It turned out cute, I think! I got all the felt, corn and leaf extras from Hobby Lobby (could spend a fortune there!) and I even used a coupon. p.s. All their fall decor is 40% right now . . . hurry! Keep an eye here on the blog for a post about my new mantel! My grandpa and I have been hard at work and it's finally affixed to my wall and we love it! I can't wait to share about it! at 12:14 PM 4 Comments Topics: Blog., Crafts., Design. We've known now for over a month the gender of our baby on board. I'm excited to share how we told our parents, grandparents and siblings. We didn't need to come up with a big grand idea to blow them away, but we wanted it to be more special than just saying "Hey, it's a ---" That would've been boring. We're not boring. So I did a ton of online searching for ways to do "gender reveals" but none were really doing anything for me. Then, I came across a baby shower favor that I loved! 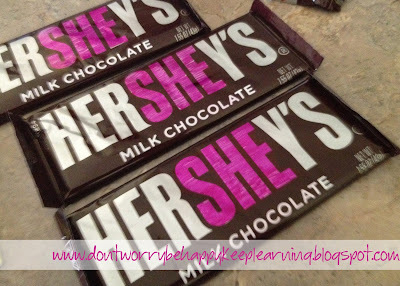 If you look at a HERSHEY bar you'll notice "HE" is at the beginning and "SHE" is in the middle. Whichever part you color in will show what baby is. I ran to the store, bought the HERSHEY bars, went home and busted out my Sharpies. Here's how they turned out! 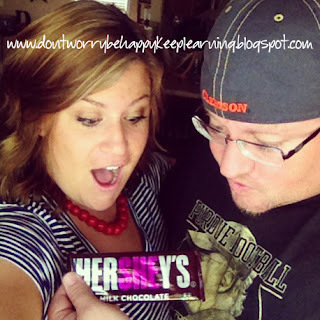 Here's how our family saw the HERSHEY bars to start. Once they unstuck the note the SHE was revealed. I was shocked when the tech said "girl" but apparently Mike wasn't. <-- and that shocked me, too. I was so sure it was a boy, so it took a while for the "girl" thing to set in. Now I'm thrilled! We're so nervous overwhelmed excited to be parents. I know it's going to be the best and most high pressured job I ever have, but I'm ready. I've been ready. And I can't wait! at 3:29 PM 0 Comments Topics: Adventures., Blog., Crafts. I'm a pretty CHEAP frugal person when it comes to home decor. 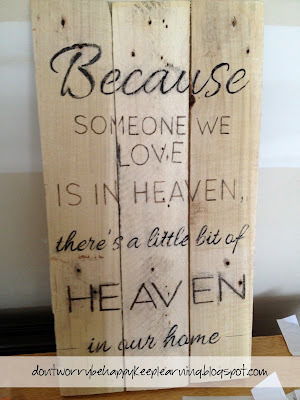 Most of the time when I'm shopping at Hobby Lobby I think to myself "I could so make that for next to nothing," because to be honest, I could! 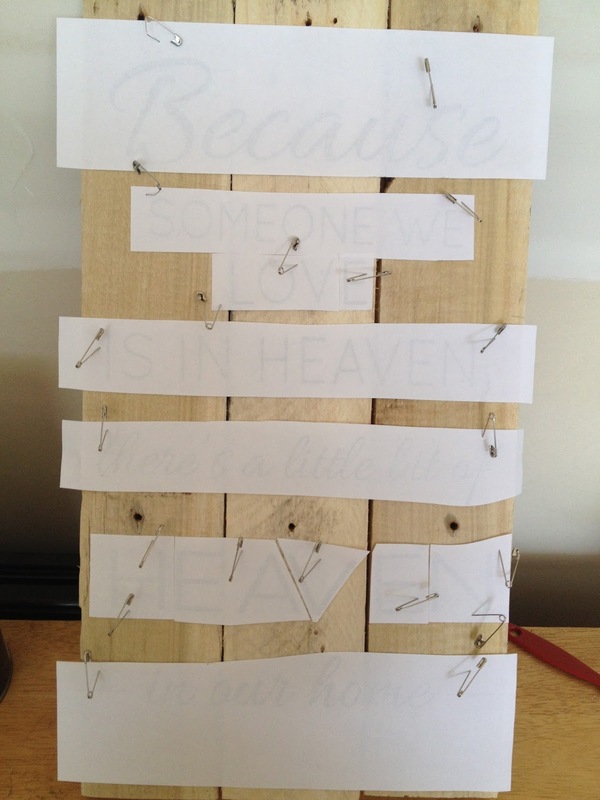 You betcha I plan to decorate baby's nursery on a dime if I can help it! 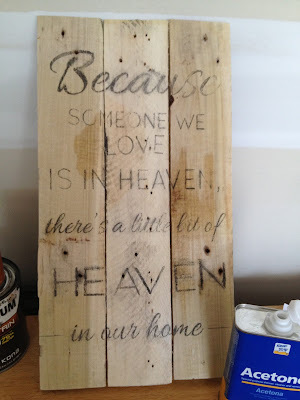 I love DIY projects and crafts for a few reasons. 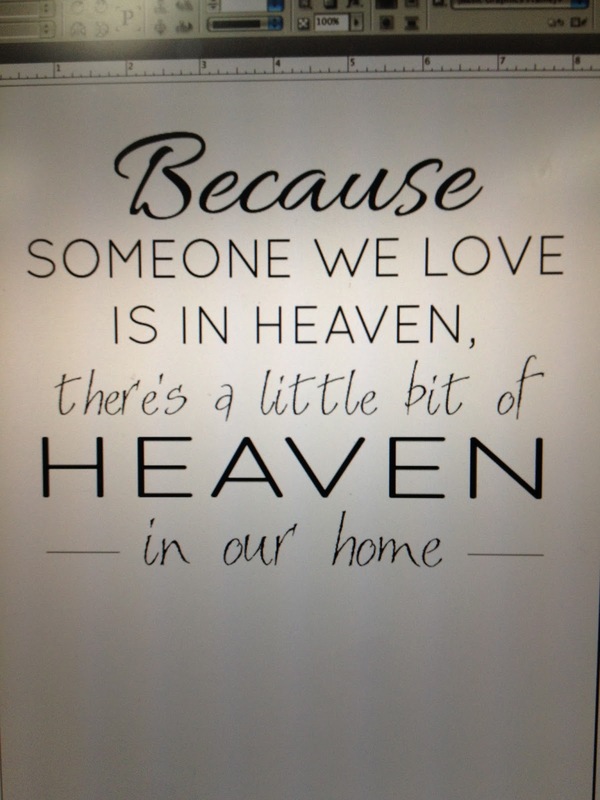 Recently, a friend asked me to design a piece of wall art that her daughter-in-law (also a friend of mine) had seen for sale on Etsy. Her mom passed away almost a year ago and this saying struck a cord for her. Plus, I'm always up for a challenge so I said yes! For the video tutorial that I followed click here. The first thing I did was design the wording on my computer. This, for me, is the easy part. I own approximately 2,493(ish) fonts so I have plenty to choose from when doing this sort of thing! It's important to mention that I printed this wording on a LASER JET printer. I did some internet searching and most tutorials recommend using a laser jet. I even tried it using a printout from an ink jet and it just didn't transfer the greatest. 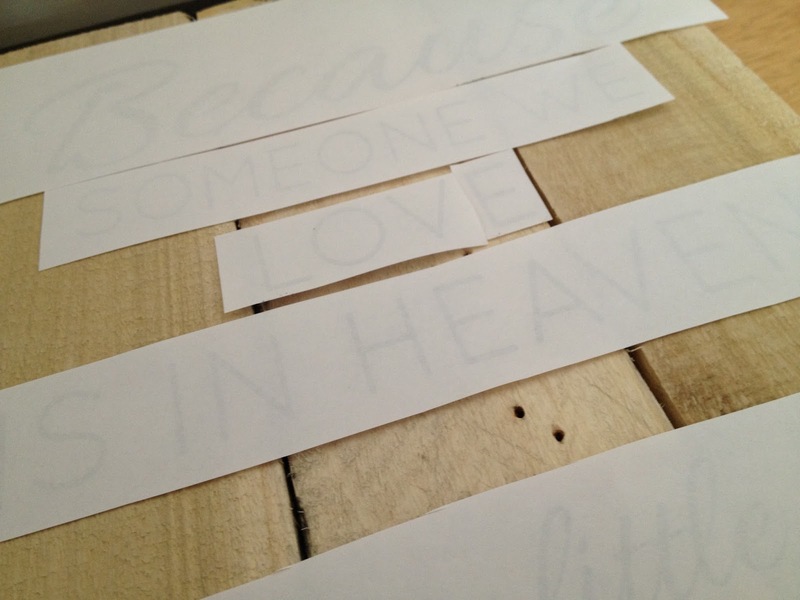 I forgot to mention a very important step when printing your text! You must print the design IN REVERSE so it applies to the word reading left to right. I typically use InDesign or Illustrator to create these sort of things and it's super simple to flip the image horizontally. As for other programs, fiddle around. I'm sure you can find an option to flip the text pre-print or "mirror" the print out in the printing options. Next I constructed the "board." 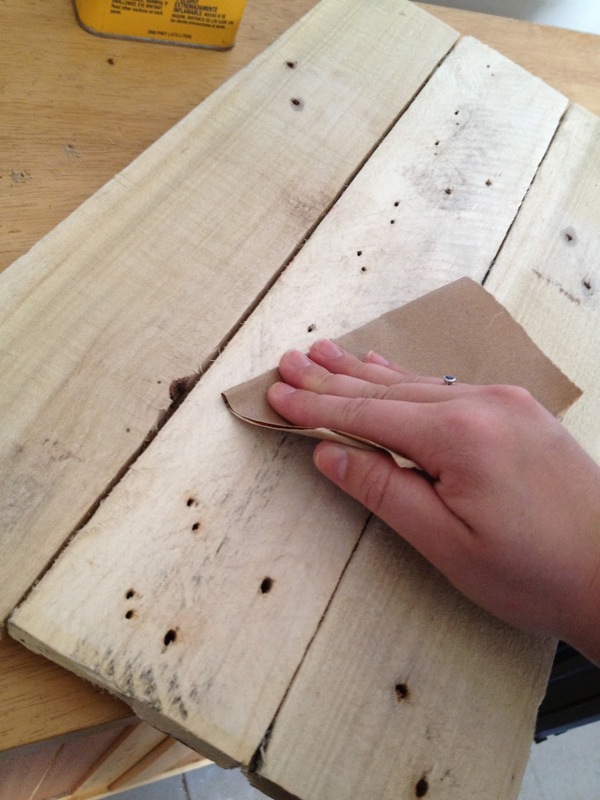 I cut sections of wood from a pallet (using my new jig saw - whoop whoop!) and connected them using shims on the back. Then I sanded the face to prepare it for applying the letters. 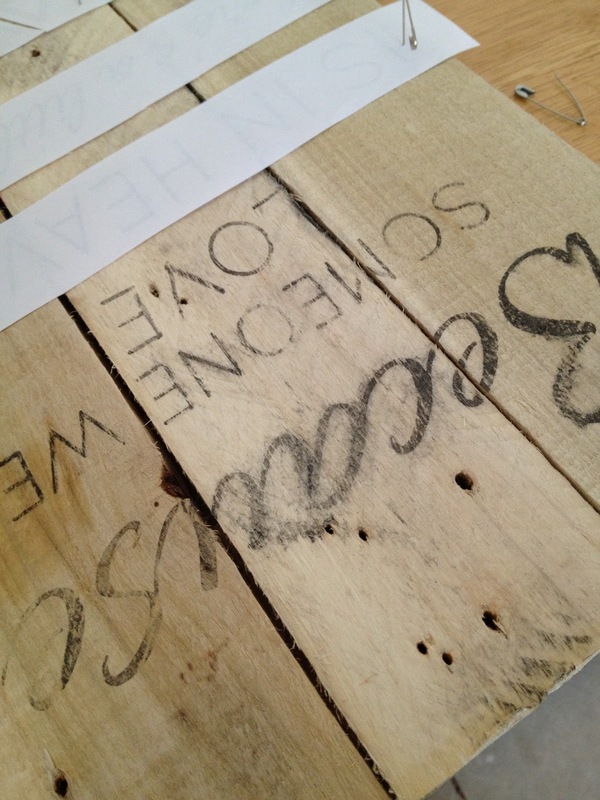 Next, I cut the words out and laid them on the wood to decide where I wanted them. 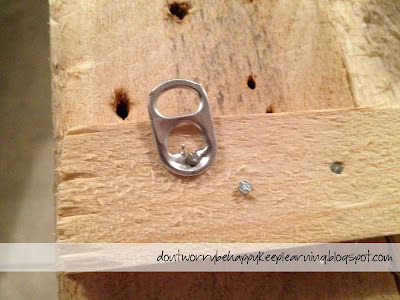 I used safety pins to secure them to the boards so they wouldn't slide. Then came the stressful intense critical step . . . transferring the ink! I poured the acetone directly on the paper over the letters. I pressed down lightly and let the acetone absorb into the paper to help "stick" it to the wood. Then I used the blunt end of my paint brush (pictured in the corner above) to rub directly over the words. I treated this like I would a scrap-booking rub-on making sure to rub firmly but not tear the paper. I took my time working my way down the board and didn't pour it all over everything at once. Acetone dries super fast, so even if I had done that it would have been dry by the time I made it to the next row. Next, I slowly peeled the strip of paper up to reveal the letters had transfered to the wood. If there was a spot that didn't transfer I laid the paper back on it and rubbed it a little more. I continued this down the board until all letters and words were applied. After examining it, I noticed it was a little lighter than I was hoping in some parts. 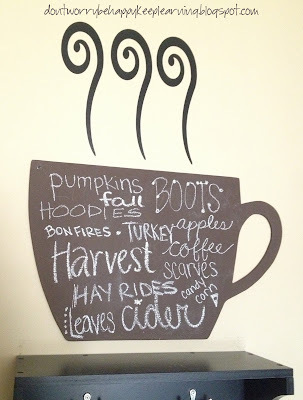 I grabbed my Stampin' Up markers and filled in spots that needed it. On the backside, I nailed in pop tabs to make hanging easier. I chose not to stain or poly coat this after I was done because it would have made the marker run. Even without the top coat I think the raw wood looks neat. I love how it turned out! And the girl who it was given to as a gift loved it, too. She even sent me a picture of where she has it hung at her home. That makes me all warm and fuzzy inside. Since this one turned out, I think I'm going to try my hand at other sayings and running the boards horizontally. I have a new sense of reassurance that I can do more of these! at 4:05 PM 5 Comments Topics: Blog., Crafts., Design., DIY., Handy Tips. I mean . . . DUDE! Can I gloat for a bit? I'm just a gal from a small town who enjoys crafts and cooking and baking and being goofy. I never thought my blog would be a big deal. Today I logged onto Blogger and took a look at my page hits. The number one post I have is the Mac & Cheese awesomeness. There have been over 2,400 page hits on that post alone since a friend of mine repinned it onto her Pinterest board. WHOA! 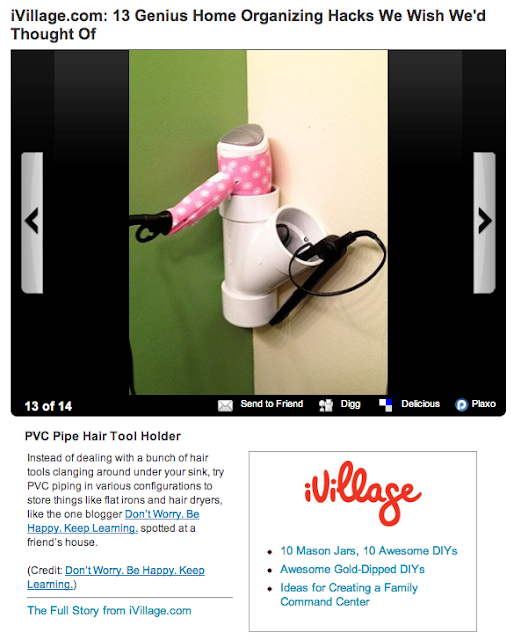 The second highest post is the one from back when I posted a picture of my friend's bathroom showing how her dad used PVC pipe to construct a home for her flat iron and hair dryer, I had NO idea it would be the hit that it is already! That post has had almost 650 page hits! One nice thing about Blogger is it tells you where most of your traffic is coming from. Usually I'll see Pinterest or other blogs, but today I saw "www.xfinity. . . something something" and thought "Whaat is that?!" 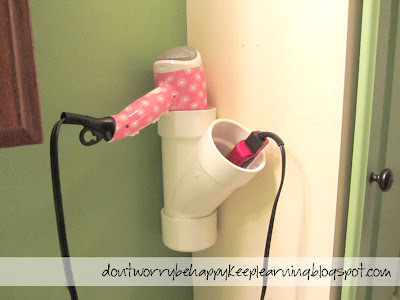 Instead of dealing with a bunch of hair tools clanging around under your sink, try PVC piping in various configurations to store things like flat irons and hair dryers, like the one blogger Don’t Worry. Be Happy. Keep Learning. spotted at a friend’s house. (Credit: Don’t Worry. Be Happy. 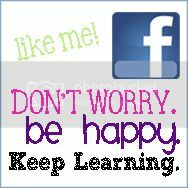 Keep Learning.)" <--- Eeeek! I find joy is small things and these two posts being big hits makes me feel like I've hit celebrity-status. So, now I'll deflate my head and get back to life. But I just thought I could share this HUGE small victory with my readers. Thanks for pinning my stuff and subscribing. I feel so loved! at 1:01 PM 15 Comments Topics: Blog., Crafts., DIY., Handy Tips., Organization., Recipes.